Khye has been writing a few letters to random friends lately. Khye said he wanted to write a letter to Amanda and put it into an envelope to send to her. We obliged and gave him an envelope. Apparently, this is how Amanda looks like. He apparently drew her face on the envelope. 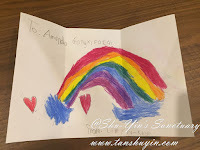 And inside he drew his fav rainbow and some hearts for her while signing off. 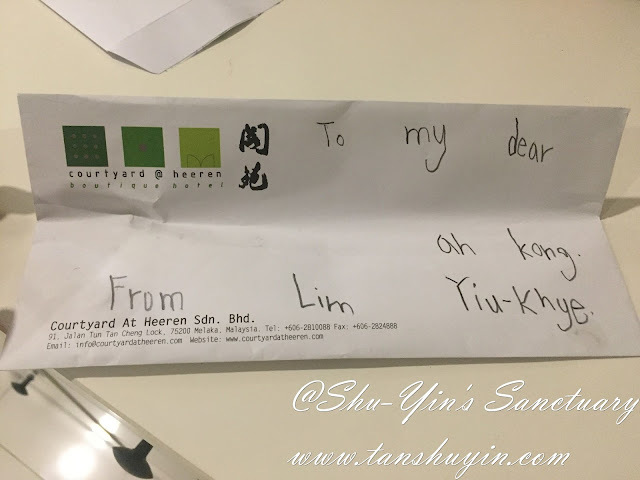 Khye does not really understand how letters are delivered, and when he wrote a letter to his dear Ah Kong when we were in Melaka, I promised him that we will get that letter sent. 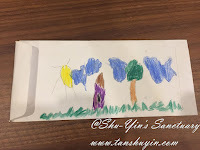 This is what he wrote for his Ah Kong on the envelope. The letter itself. 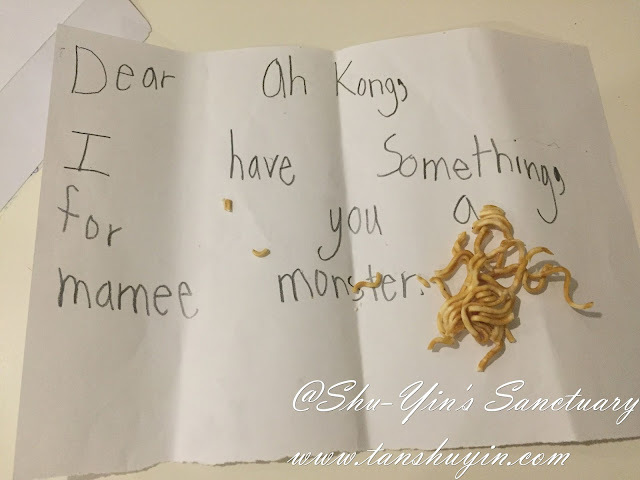 He actually put some of his precious Mamee Monster snack into the envelope as a "present" for his Ah Kong. 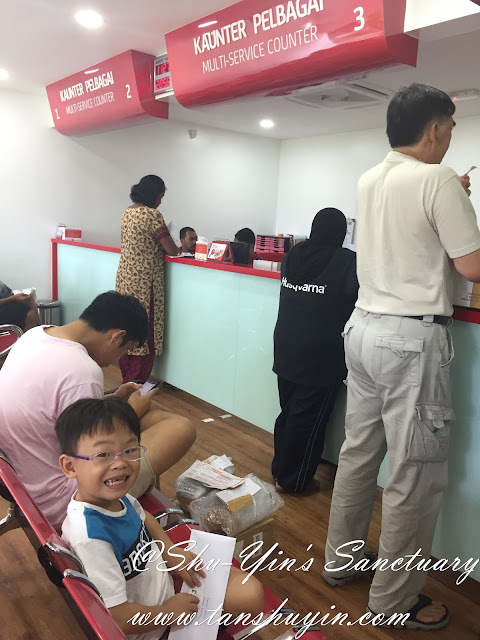 So off we went to the Post Office just last Monday, which was a mistake because it was the Monday after the long Merdeka weekend. So the post office was really full of people. Anyway, I put his whole envelope and letter into a new blank envelope. 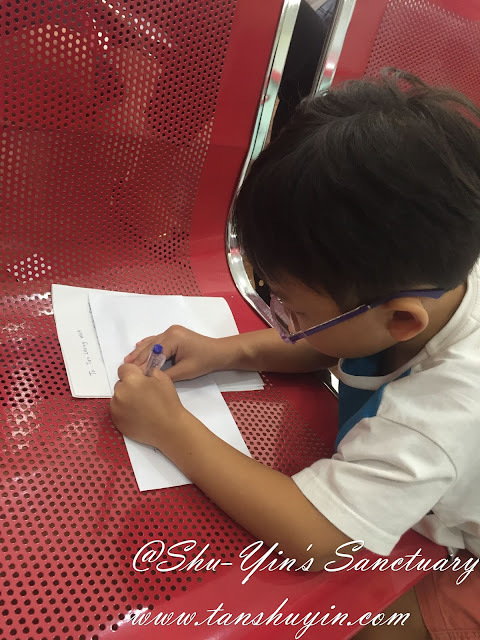 Then I got him to write down Ah Kong's name and helped him with the address. We waitied 45 minutes just for our number to be called to buy some stamps! "_"
He waited quite patiently with me. A bit whiny towards the end because we went there straight after school and he was without lunch yet. Coz I did not expect to wait so long just to buy stamps! When it was our turn, I found out that there was no more 30 sen stamps. Hahaha. Nowadays is 60 sen for white envelope and 80 cents for other colours. And there is GST too! 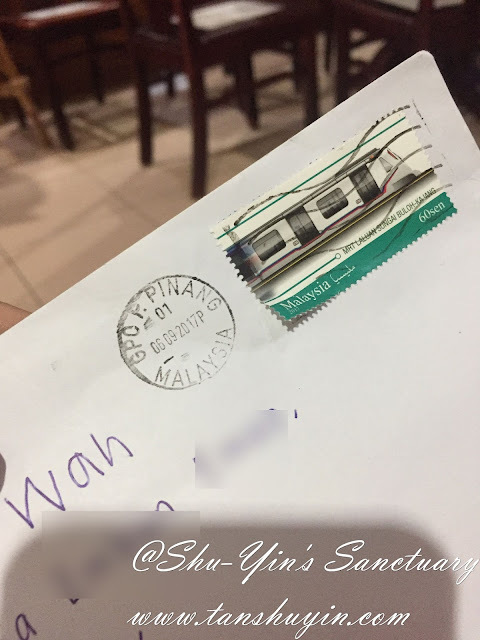 So we paid 65 sen to send that letter! I let him adhered the stamp on the top right corner of the envelop and let him post the letter himself. Next, is the waiting game. 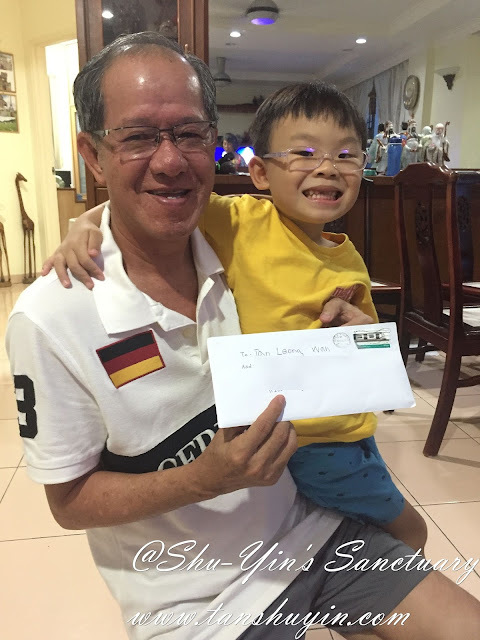 I told him it would take a day or two for the postman to collect all the letters from there and then delivered it to Ah Kong. 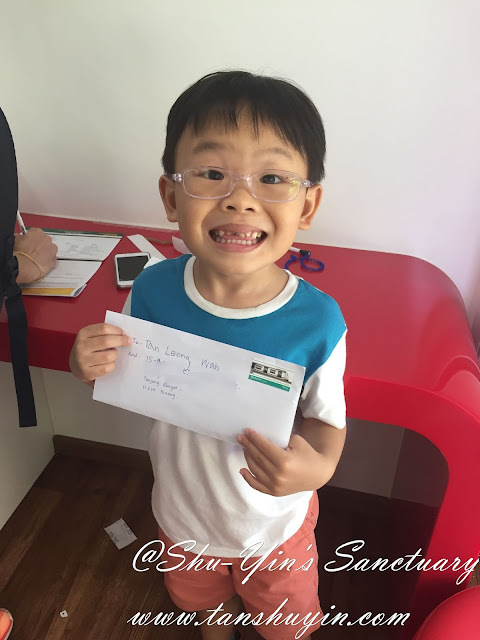 He was excited when Ah Kong received the letter. He saw that there was a date stamped on the stamp. 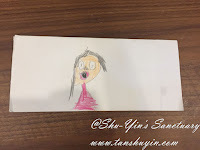 This is how Khye learned how to post a letter. I think this is still an important experience to let kids try, as nowadays they only know how to send sms/messages/email through the phone or internet. 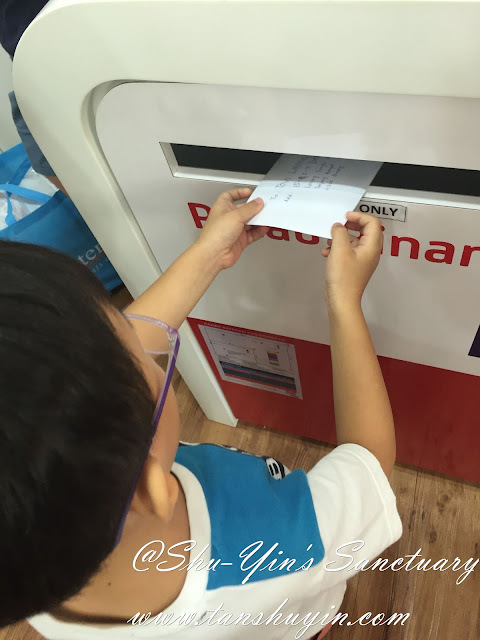 Khye now tells me he wants to post more letter to more people! 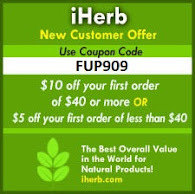 "_"